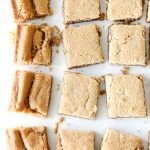 These Chewy Peanut Butter Blondies are rich, peanut buttery and SO delicious! They won’t last long! Using a mixer, cream together the butter, peanut butter and sugars. Add the vanilla and eggs, mix until smooth. Add the flour mix to the butter mix and combine, don’t over mix. Spread the batter in a 9×13 baking dish. Bake for 40 – 45 minutes, or until the centre doesn’t jiggle, and the edges are brown. Wait for at least 15 minutes (30 is better) before cutting into squares.